Description :-This is very popular tool amongst jewelers for excellent performance. Constructed with hardwood handle for comfortable grip and Durable. Excellent for carving, jewelry repair, hobbyists, etc. 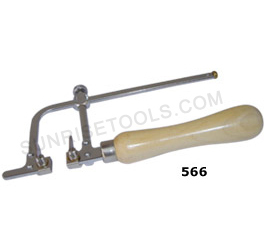 561 Saw frame german type adjustable 2¼"
561A Saw frame german type adjustable 3"
561B Saw frame german type adjustable 4"
561C Saw frame german type adjustable 5"
561D Saw frame german type adjustable 6"
Description :-This Saw frame used by Jewelers, Silversmiths, in Hobby Crafts and wood working. 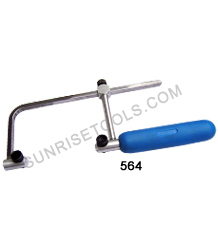 It is strongly constructed with flat steel frames, hardwood handles and thumb screw locking devices. Also it features a tension screw to adjust the blade to the exact tension desired. 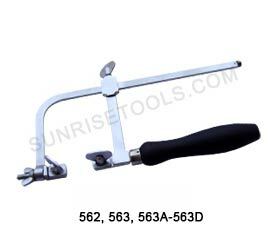 563 Saw frame adjustable with tension screw 3"
563A Saw frame adjustable with tension screw 4"
563B Saw frame adjustable with tension screw 5"
563C Saw frame adjustable with tension screw 6"
563D Saw frame adjustable with tension screw 8"
Description :-This is lightweight, adjustable, perfectly balanced saw frame. For use with piercing, flat and spiral saw blades. Serrated clamps hold blades firmly. Constructed with a flat steel frame, cushioned handle and thumb screw locking devices. Will last for years. 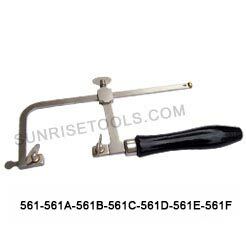 Description :- This saw frame is adjusts easily, and hold your blades well. 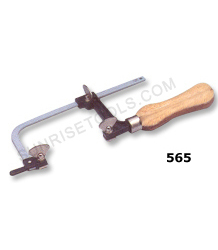 564A Round Adjusting Knobs helps hold the blades securely, Throat Depth 3.5"
Description :-This economy adjustable saw frame is made from metal frame with wooden handle and ideal for cutting all metals, plastic and wood. It is precision made of the highest quality spring steel with a non glare finish. 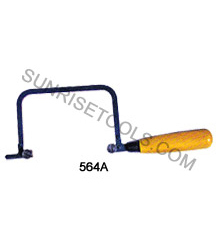 Description :-This Deluxe saw frame feature rigid construction and fine balance for serious craftsman. Made from finest quality material. The tightening knobs are large making adjustments and saw blade replacement extremely quick and easy.